ARMONK, NY	- 04 Oct 2006: IBM (NYSE: IBM) today revealed a cross-company effort to make the IBM System z mainframe -- the world's most sophisticated business computer -- easier to use for a greater number of computer professionals by 2011. The goal of this five-year effort, which will include an investment of approximately $100 million, is to enable technology administrators and computer programmers to more easily program, manage and administer a mainframe system -- as well as to increasingly automate the development and deployment of applications for the mainframe environment. The initiative, involving a team of hardware and software experts, leverages IBM's expertise in automation and systems management. 1) Automated configuration checking -- to make it easier for information technology administrators and computer programmers to predict and avoid technical problems. 2) Modernizing the mainframe user interface -- including network configuration, systems management, and data center hardware configurationdesigned with both existing IT staff and the new generation of IT workers in mind. 3) Improving software asset management technologies -- to make it easier for users to control software costs and, as well, simplify and automate the acquisition of software services. 4) Modernizing the mainframe's development environment with visual tools that enable novices to quickly learn how to program for the mainframe. The IBM Health Checker for z/OS: This z/OS "personal trainer" actively monitors z/OS systems and recommends configuration tune-ups that can improve system resilience, security, and performance. Tivoli's IBM OMEGAMON z/OS Management Console: The OMEGAMON z/OS Management Console provides a modern, graphical user interface for z/OS management. Real-time data delivered by the IBM Health Checker can easily automate, eliminate and simplify many z/OS management tasks. IBM plans to expand the role of the Management Console over time to continue to put a modern face on z/OS management and administration. Hardware Configuration Manager (HCM): In z/OS V1R8, HCM has taken a leap forward in simplifying System z hardware configuration. Enhancements include new configuration wizards, the ability to import and export I/O Definition Files, and integrated access to RMF Monitor III reports which can help speed up the detection and resolution of performance bottlenecks. IBM Configuration Assistant for z/OS Communications Server: This tool was introduced in V1.7 as the z/OS Network Security Configuration Assistant. The Assistant, which has been enhanced in V1R8, guides network administrators through the setup of the latest network features of z/OS and is designed to help avoid costly configuration errors. Application Development Simplification: WebSphere and Rational continue to deliver a strong set of solutions to simplify the development, maintenance and modernization of new and core z/OS business applications. These solutions include modern desktop tools for developing, transforming, testing, and deploying applications to z/OS. Open Standards: IBM's support of cross-platform open standards and programming models on System z include recent innovations in service- oriented architectures. Information Simplification: The z/OS Basic Skills Information Center is a new web resource designed specifically for IT professionals who are new to the mainframe and z/OS. V1R8 also features a new how-to manual, z/OS Problem Management that guides customers through the task of identifying, analyzing, and reporting z/OS problems. Many more improvements to z/OS information are on the horizon. "The new z/OS version coupled with more automation of management tasks and streamlined information delivery will make life easier for novices and experts alike," said Jim Stallings, general manager for IBM System z. "From a strategic perspective, a focus in mainframe simplification increases the attractiveness of the platform to a broader swath of IT professionals, while at the same time continuing to provide clients with what is recognized as the most sophisticated business computing system on the planet." be able to handle the Big Iron in a matter of months. management, with centralized key management for encryption, a single centralized security database and easy administration via directory services. As well, data management on z/OS can be fully automated to provide multi-level storage management and backup, with multi-level recovery. World-class database serving capabilities, enhanced security features designed to help ease security and regulatory compliance concerns and simplified network configuration and automated network management form a solid foundation for enterprise computing. 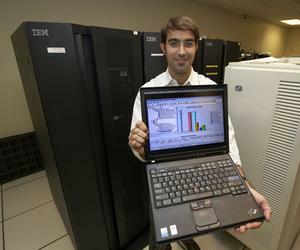 IBM engineer Benjamin Bayat demonstrates the Health Checker, part of the new graphical user interface on the IBM System z mainframe operating system. Graphical interfaces are part of a five-year, $100 million IBM program to make the mainframe so simple to use that anyone with a computer science background will be able to handle the Big Iron in a matter of months.